A great classic of Magic !!! The performer shows a silk handkerchief and puts it into his left fist. After some magical passes he turns it into an egg. Immediately he says that he will explain the secret of the effect: the egg is made of plastic and it has got a hole through which the silk is put into. “Nevertheless” the magician says” someone would be likely to want to check the egg after the transformation. If this happens” he goes on saying” you only have to blow over it and turn it into a real egg”. 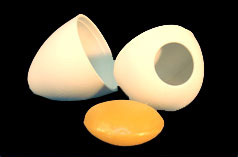 While saying so the performer cracks the egg into a glass allowing the audience to see that inside the glass you have the white of egg and the yolk. -Great for kids shows and perfect for adults. 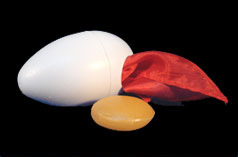 -The egg is made of high impact plastic. -Comes with one special plastic yolk.